This time of year I get asked often, “how do I get those stupid dead bugs off the front of my car?”. Great question. While this might seem like a simple thing to address, it can be very difficult to get them off your vehicle without damaging the paint. If your paint is in good shape and well waxed, the removal will be easier. I have had people tell me to “use this and try that”. I have even had people tell me to use dryer sheets! That actually seems to work pretty well, but I have had people tell me they marred the paint on their vehicle scrubbing too hard. On a recent road trip as the sun was setting just outside Sacramento California, we went through a 40 mile section of millions and millions of bugs! It was gross. 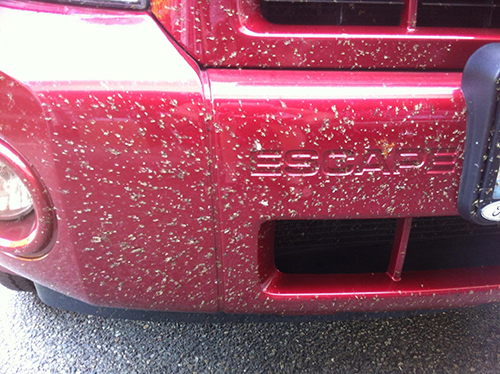 And by the time I completed my 2,400 mile round trip, those bugs were adhered pretty well. I had bugs on bugs and they were everywhere! For the grill and AC condensor, I just used a vacuum cleaner with a soft brush and most of the big pieces came right off. But the painted area, that was a different story! So, I turned to an expert. Blake Siebe manages Northwest Auto Salon. He and his crew do their magic on exotics as well as your everyday ride. Make sure to check them out here. Blake recommends a citrus degreaser so as not to damage the paint. He likes a product called P21 S Total Auto Wash. First, hose off the area well and soaking won’t hurt. Then take the P21 S Total Auto Wash and soak the bugs. After it sits for a bit, use a clean wash towel and wash it off. I already had some citrus cleaner and gave it a shot. It worked great! So, thank you Blake for the expert advice! Also, make sure to wax the area you just cleaned. A well waxed surface is much easier to clean! I have found that if you carefully Rain-X your windscreen/windshield, it is much easier to clean as well. Or, give Northwest Auto Salon a call (206)920-9730 and they can do it for you! They do fantastic work!